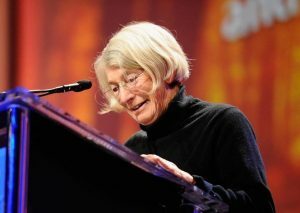 Mary Oliver, who died on Jan. 17 at age 83, was probably America’s favorite contemporary poet. As one obituary I read points outs, she was rare in possessing both a large popular following and sufficient respect from the literary prize-givers to be awarded a Pulitzer Prize and the National Book Award. Commentators often used the word “accessible” in explaining her popularity. One of Mary Oliver’s best loved poems, cited in a number of the appreciations and obituaries written since her death, is “In Blackwater Woods.” The title itself is an interesting choice, because the poem itself offers so many opportunities for a grander statement. But the poet eschewed grand statements in choosing a title, perhaps wary of the grandiose. I think the title was meant to suggest ‘no grand claims are being offered here,’ though in fact the grandest ones do arrive — naturally. I think the chosen title understates the ambition of the poem. Similarly, Mary Oliver’s “accessible” poems don’t rely on unusual vocabulary, difficult syntax, or complicated formal structures, but that doesn’t mean they are short of artistry. The poem consists entirely of common words and is structured in four-line, free verse stanzas. The formal patterning of the stanzas creates that ‘certain formal feeling’ that Dickinson famously borrowed from standard English hymns. The structure also helps establish a certain expectation, the one that reminds us that ‘poetry’ has the same origins as ‘song.’ Yet you could write the words and sentences out, just as they are ordered here, in a paragraph, and the result would read like prose. It would be grammatical. But this is poetry — i.e. the intensification of feeling — not prose. The lines are very short, frequently consisting of only two, three, or four words. This is a common approach to free verse, popular for a century or more, reminding us of William Carlos Williams’ iconic miniature “So Much Depends.” The basic approach to enjambment in this sort of free verse — where to end the line — is to follow spoken English syntax. But in this poem the poet frequently breaks syntactical units into even smaller pieces. “Look, the trees” therefore stands by itself as a line. The enjambment turns these three words into a (temporarily) completed statement: ‘Look! the trees.’ Almost everybody who writes about nature has written something like this. It’s Thoreau’s advice on achieving wisdom and spiritual freedom: look at trees. ‘into pillars’ — yet another miracle! Each of these steps to the completed clause, a grammatically complete statement, is itself a marvel, and the tiny pauses — which the eye of the reader respects, even if the brain rushes on — gives the reader’s mind pause as well. Then, there is the matter of poet’s chosen words. Patterned syntax keeps the sentence alive in the second stanza. We are often told that poems appeal to the senses; here’s an example. Those same trees that wondrously turn themselves into pillars of light, are also, as we read in the second stanza “giving off the rich/ fragrance of cinnamon/ and fulfillment.” Poetry imagines with the guidance of the senses. Because we know the scent of cinnamon, we are more likely to make the leap to “fulfillment.” We don’t ‘smell’ fulfillment physically; only metaphorically. And fulfillment is one the themes of the poem. Following syntax once again, a new stanza offers yet another completed clause — all these clause follow the familiar Biblical and classical imperative “Look,” the poem’s first word. A classical guide would typically follow that word with an exclamation point. A century ago English poet-novelist D.H. Lawrence wrote “Look! We have come through!” — a poem about not destroying your marriage in the first few months. The foreshortened syntax, I believe, reflects the interruptions in our conventional thought patterns brought about by the experience the poem seeks to express. The rebirth of nature is the great interrupter of ordinary patterns of thought. Human events are commonly shaped into stories; they have a beginning, a middle and an end. But the life the world — its trees and its ponds — exceeds these patterns. Nature, as understood by the seasons, has a beginning, a turn, an end — and then, guess what? — a new beginning. And as if that were not ‘meaning’ enough for any poem, much less any beautifully descriptive ‘nature poem,’ the poet offers a frankly prescriptive advisory on how to live. You can go back to the poem and read those three things yourself. Then ask whether you have heard or read a better, more economically stated expression of three such important ‘things.’ Many of us — readers, that is, who turn to poetry rather than to creeds for sustenance — are likely to come away (as I am) from this poem resolved to take these words to heart, to remember them, and to live their message. And many of us are likely, or at least tempted, to believe (perhaps as a matter of faith) that Mary Oliver did just that.